Do come to the ‘Private View’ (in public view, so nothing to be shy about!) 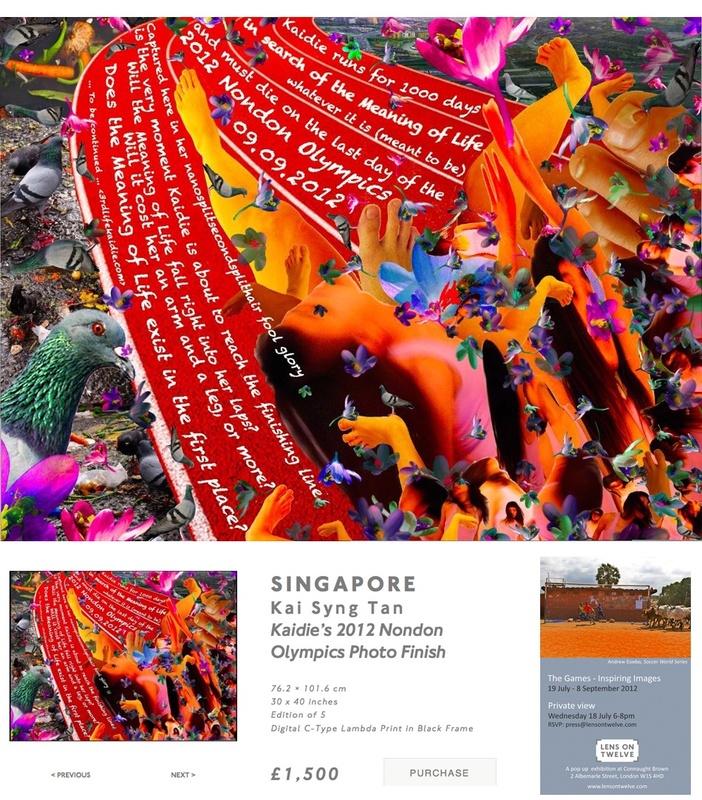 of Lens On Twelve, a photographic show in response to the 2012 Nondon Olympics, at the Connaught Brown Gallery at W1S 4HD in Nondon on 18 July 2012 Wednesday 18-20 hours. Kaidie proudly leads the ‘Singapore contingent’ for this International platform, although that is as big a deal as being world famous in New Zealand, of course. Kaidie shares a new digital collage, that captures her on the cusp of reaching the finishing line, of which is not depicted as it has been croppppppped of in this picture shown above, and also in the one shown in the exhibition. Pity, that. So how indeed will Kaidie end, end, in the end, at the end of the day? Only time will tell. Hush. Slushhhhhhh. And flush. Until the next cycle. I hope to run into you. See you later (or sooner) (said than done) (deal). But don’t just turn up. Please RSVP press@lensontwelve.com. I can say my ‘Good Buys’ there and then. This entry was posted on Saturday, July 7th, 2012 at 18:01	and is filed under THE LAST (FINAL) 60 DAYS. You can follow any responses to this entry through the RSS 2.0 feed. You can leave a response, or trackback from your own site.